In this analysis we are looking to better understand the associated right heart failure and peripheral edema AEs that have been reported to FAERS in patients age 65 years or older, where an ERA is concomitant with a a PDE5 inhibitor. 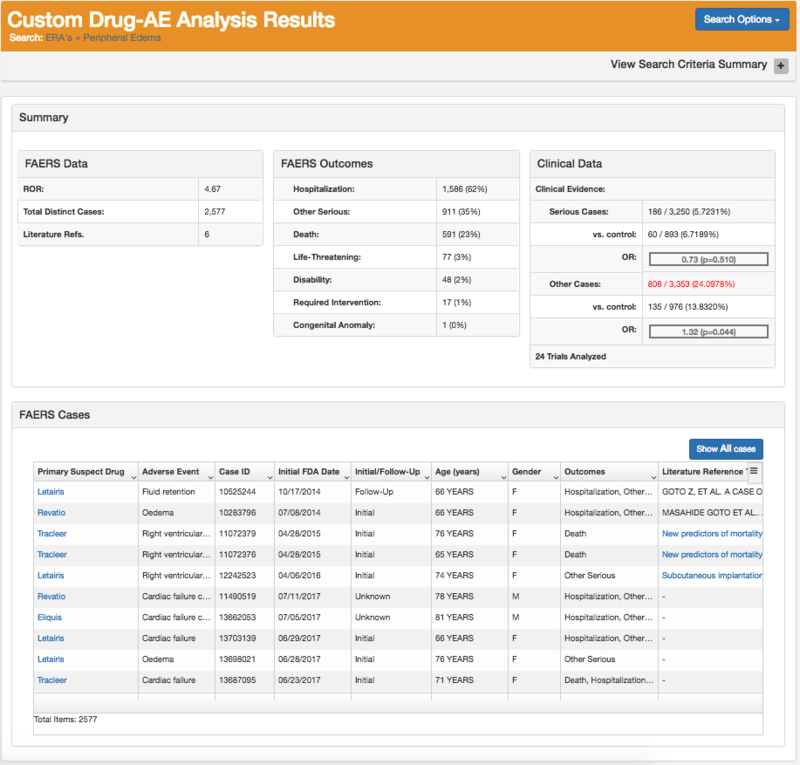 In order to run this analysis, we need to first select the drugs. you can see that we have chosen to look at Letairis (ambrisentan) OR Tracleer (bosentan) OR Opsumit (macitentan) (the ERAs on market) when use with (AND) Adcirca (tadalafil) OR Revatio (sidenafil) OR Cialis (tadalafil) OR Levitra (vardenafil) OR Viagra (sildenafil) OR Staxyn (vardenafil) OR Stendra (avanafil). We've selected several MedDRA Preferred Terms (PTs) that correspond with right heart failure and peripheral edema. and also chosen patients who were at least 65 year old at the time of the Adverse Event. Now we can run our search. You can see the results in the screen shot below. The search returned 2,577 distinct cases where: i) an ERA was used with a PDE5; ii) an adverse event related to right heart failure and peripheral edema was reported; and iii) the patient was over 65. The Evidex statistical engine calculated a ROR of 4.67, which suggests that reporting of these adverse events in this specific population is elevated. The individual cases are shown at the bottom, with literature references where available. A pooled meta-analysis from clinical trials results is also calculated via Evidex's statistical engine and displayed. A treasure trove of information in minutes, with a few clicks of the mouse. 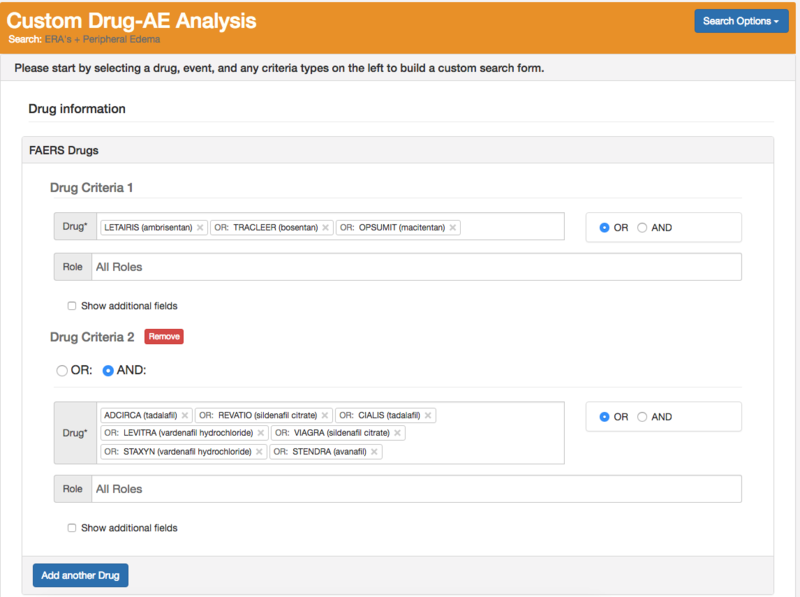 If you are a client, login today to test out the Custom Drug-AE Analysis, the first of many Custom Analytics. Not a client? 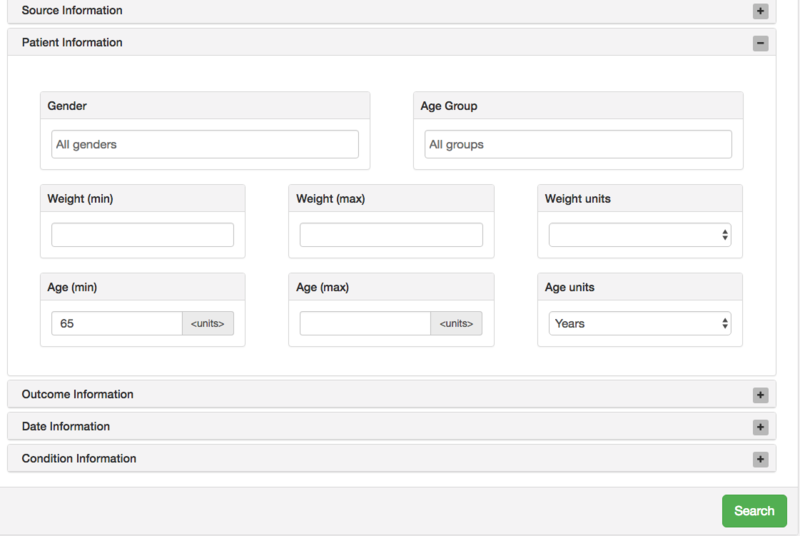 Request a demo using the form below.